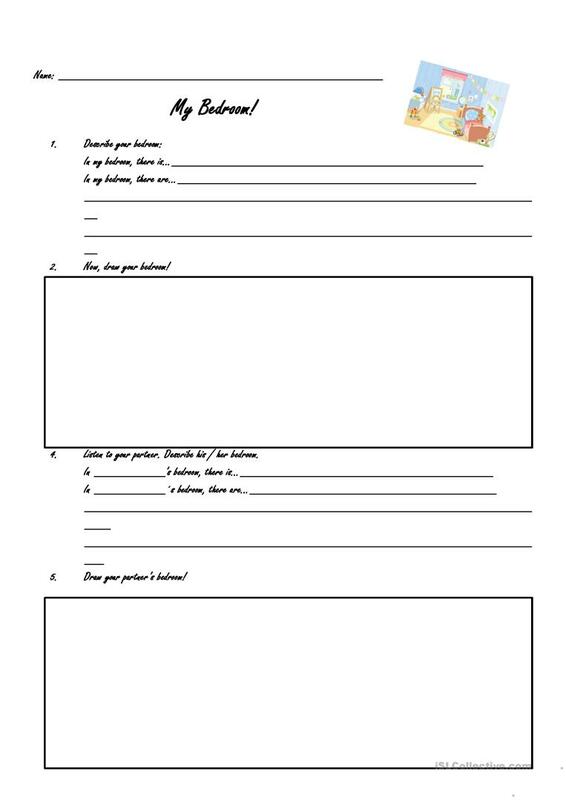 Simple worksheet to practice grammar, writing, bedroom vocabulary and speaking at the same time. Students describe and draw their own bedroom, then listen to their parter's description and raw their own bedroom. In the end, they compare their drawings. The above downloadable printable is best suited for elementary school students and adults at Beginner (pre-A1) and Elementary (A1) level. It is great for consolidating Prepositions of place and There is / there are / there was / there were / there will be, etc. in English, and can be used for developing your class' Writing skills. It is focused on the vocabulary topic of Furniture and Home. NataliaDLS is from/lives in Mexico and has been a member of iSLCollective since 2014-03-29 18:52:59. NataliaDLS last logged in on 2019-04-23 13:33:50, and has shared 3 resources on iSLCollective so far.